This page is a list of women Marquis de Sade was involved with, either romantically, for paid services, family or platonic love. First there is his wife, Renée-Pélagie de Montreuil, her sister Anne-Prospère de Launay and their mother Madame de Montreuil, Sade's mother-in-law. The women of his scandals are Jeanne Testard, Rose Keller and Marguerite Coste. His lovers include Constance Quesnet and Marguerite Coste. Finally, there is the friend of himself and his wife, Marie-Dorothée de Rousset, whith whom Sade had a platonic friendship. 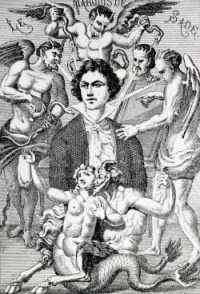 On October 18, 1763 the Marquis de Sade offered the 20 year old pregnant Testard 2 gold louis to go home with him. In his bedroom he asked the young woman if she believed in God, Jesus Christ and the Virgin Mary. On April 3rd, 1768, Easter Day Rose Keller is picked up by the Marquis de Sade and taken back to a house in Arcueil, where she was bound and flogged. Marguerite Coste, a 25-year-old prostitute from Marseille, was the victim of a non-lethal poisoning case, one of the scandals of Marquis de Sade, usually known as the "Marseilles affair". Renée Pélagie de Montreuil (December 3, 1741 - July 7, 1810) was the wife of Marquis de Sade. Described as "a plain and uneducated young aristocrat, raised in fear of God, when she was married on May 17, 1763 to the Marquis de Sade by her unscrupulous parents. He already was a libertine and atheist. Yet, from the day they met, Renée Pélagie fell passionately in love with her husband and devoted herself totally to him. It's Sade's first and only marriage. Renée's 10-year-younger sister Anne-Prospère de Launay, became his mistress with her blessing eight years later." Anne-Prospère de Launay (December 27, 1751 - May 13, 1781) was the sister-in-law of Marquis de Sade. In the autumn of 1771 Anne-Prospère left her convent to make her home with the de Sades and their children after which Sade began an affair with her. She wrote the passionate letter, written in blood « Je jure à M. le marquis de Sade, mon amant, de n’être jamais qu’à lui. … de ne jamais ni ne me marier, ni me donner à d’autres, de lui être fidèlement attachée, tant que le sang dont je me sers pour sceller ce serment coulera dans mes veines. Je lui fais le sacrifice de ma vie, de mon amour et de mes sentiments, avec la même ardeur que je lui ai fait celui de ma virginité. (…) »). This letter was kept by Sade, transmitted to his descendents and discovered and published in 2006 by Maurice Lever among three other letters by the young lady. On May 10 1781 Lady Anne de Launay falls ill with smallpox, the first signs of the disease appearing on Thursday evening. On May 13 she dies at 1:00 p.m.
Madame de Montreuil (1741 – 1810) was the Marquis de Sade's mother-in-law. She obtained multiple lettres de cachet to ensure de Sade's continuous imprisonment in the Bastille and Charenton. August 25, 1790 - Sade meets Marie-Constance Quesnet, age 33, a former actress, abandoned by her husband. Sade's relationship with her and with her six-year old son Charles will last the rest of Sade's life. Sade dedicates Justine to her. Mademoiselle Beauvoisin was a dancer. She met the Marquis de Sade on April 26, 1765. She was one month pregnant when they became lovers. The affair ended on January 3, 1766. Marie-Dorothée de Rousset (1744-1784), known as Milli, was a friend of Marquis de Sade and of his wife Renée-Pélagie. Unless indicated otherwise, the text in this article is either based on Wikipedia article "Sadeian women" or another language Wikipedia page thereof used under the terms of the GNU Free Documentation License; or on original research by Jahsonic and friends. See Art and Popular Culture's copyright notice. This page was last modified 06:07, 15 September 2015. This page has been accessed 2,640 times.